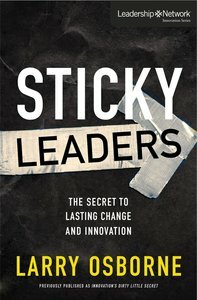 About "Sticky Leaders (Leadership Network Innovation Series)"
Larry Osborne (DMin.,Talbot Theological Seminary) is a teaching pastor at North Coast Church in northern San Diego County. North Coast is widely recognized as one of the most influential and innovative churches in America. Osborne speaks extensively on the subjects of leadership and spiritual formation. He and his wife, Nancy, live in Oceanside, California.